My daughter loves to do yoga – quite honestly I have no idea if the pose she is doing is a real “yoga” pose but she does it at school so I have to assume it is… We have several yoga mats that are just your basic rubber like mats. This Yoga Mat With Towel Combo is very unique. It is 68″x24″x 1/8″(3mm) and non-slip. It isn’t just for yoga but it is also great for pilates (my favorite). The bottom layer is your basic yoga mat but the top layer (attached) is an absorbent, very soft, microfiber layer. It is so much more comfortable to work out on. As you can see in my photo, it is great for any age – my daughter is 10 and uses it just fine and I am… NOT 10… and love it just as much. 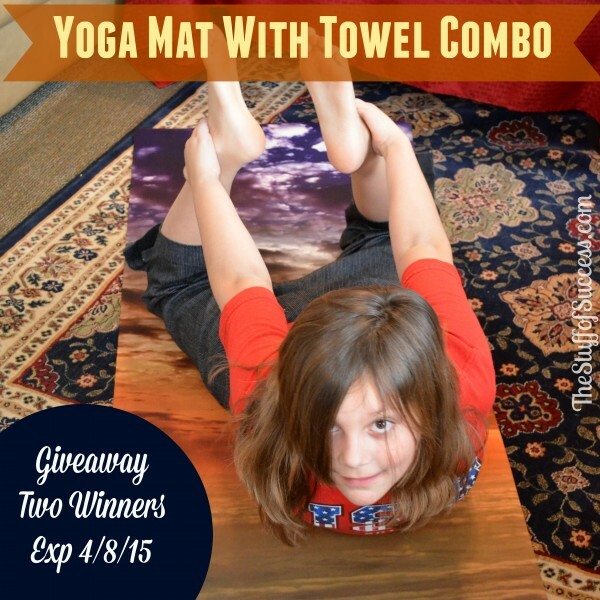 One lucky reader will win a Yoga Mat and Towel Combo. The prize will be sent directly to the winner from the sponsor. Please allow 6-8 weeks for shipping. The giveaway will run until 04/08/15 at 11:59pm EST. The winner will be chosen randomly via Giveaway Tools and will be announced on the Giveaway Tool Widget. Any taxes or other charges that may be part of the prize are the winner’s sole responsibility. The giveaway is open to United States residents only. You must be over 18 years of age and you guarantee that you are eligible by entering. We reserve the right to cancel any giveaway. No purchase is necessary. One entry per person per household. This giveaway is in no way sponsored, endorsed or administered by, or associated with Facebook. my 4yo son enjoys yoga, so I’d like for him to have his own mat to practice next to me!